Só quando vi as fotos é que reparei que não tinha nenhuma de jeito com o casaco vestido! Mia culpa! When I was checking the pictures on the computer, I've noticed that I didn't have one with my jacket on. My fault! Adoro este look, quero uma saia plissada com urgência :D Tás diva como sempre! Como assim não gostas destas fotografias? Estão maravilhosas, o vento só acrescenta dinamismo! E o conjunto está lindo, também. Essa saia é muito bonita, mesmo. Adoro o look. A saia é linda e a camisola é mesmo fofa. Que rollazo de estilo! Me encanta la Midi skirt!! Your pics are goals! Love the look! Thank you so much Colli! cute outfit, you look amazing! Love the bag with this outfit, so nice! Ahh the weather can be so difficult! You look gorgeous in these photos! I love your hair back in the hat. Thank you so much Amy! It's kinda difficult for me to wear my hair like this instead of the usual but with so much wind, it was my best option! OMG I'm obsessing over your outfit. Seriously love everything! SO in love with how you styled this maxi skirt with an oversized sweater! So cute for colder weather. Check out my latest blog post if you get a chance! Thank you so much! I love the midi skirt plus oversized knit combo! Heare from top to bottom. The skirt is pure perfection! Por acaso eu gosto de ver o meu cabelo sem qualquer penteado, por isso quando está vento nem fotografo ahah! Tu estás linda babe, como sempre! E adoro ver-te de boina! You look gorgeous! I love that pleated skirt! Such a gorgeous outfit you got here babe! 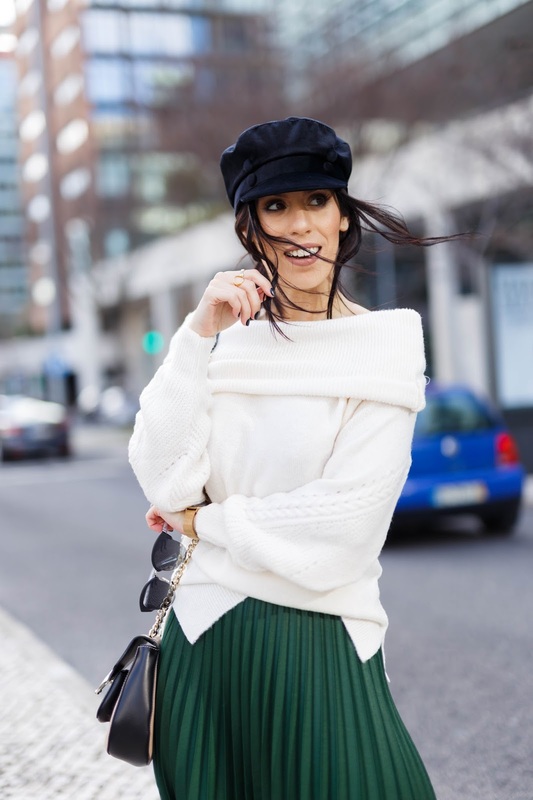 I absolutely love the pleated green skirt on that beautiful and cozy white sweater. You look such a darling! 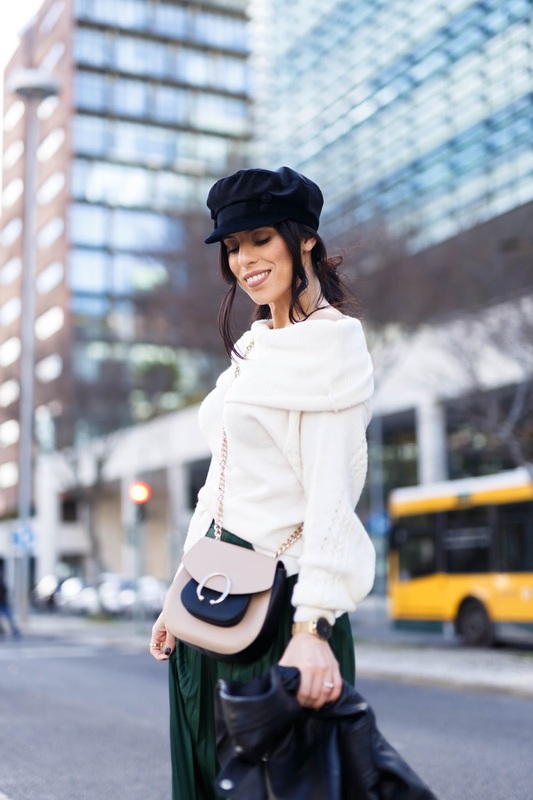 O look está muito giro, especialmente, a saia! E a minha peça favorita!